Everyone of us knows that the first impression means a lot and none of us wants to make a negative one, isn’t it? And when it comes to welcoming people into your home & showing off your personal taste, it becomes all the more important that the guests are impressed right from the word go. That’s why this homify article is dedicated to the first interior space people see upon entering a house – the good old hallway. Be it the classic narrow corridor, a small rectangle by the front entrance door, or an expansive space, hallways oftentimes pose a design challenge. Adding to the sometimes tricky shape & proportion is the need to simultaneously create storage, make a style statement, and endure a busy contemporary household’s wear & tear… ..PHEW! This is why it is considered a design challenge even by the biggest experts. Also, the most of us tend to focus on styling, decorating & tidying up the other areas like the kitchen, living room, stairway, bedroom or bathroom, simply treating the entrance hall to merely a quick dusting. That’s a BIG no! Agreed, the hallway isn’t a space where you tend to linger long. Nevertheless, it needs to look visually decent and be practical. Nobody can deny that the right lighting, palette, furniture & decor can instantly pep up the mood. The design experts & room decorators also vouch for the might of a tastefully bedecked entrance hallway in jazzing up the home interiors. And besides, it can give your neighbors some serious home envy too! 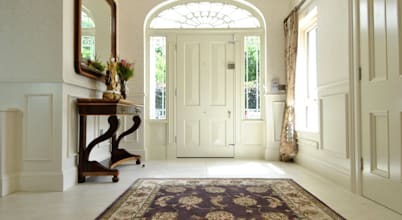 Today we are talking about 7 common mistakes people make when designing the entrance hall, and how to avoid making them. Join in to take a closer look at how you can get yours functionally poised & visually appealing. Get, set, go!